Another awesome themed 3D print file set is up on Kickstarter, "Titans of Legend"
Even dating to before recorded history, some of the greatest heroes and villains of myth and legend have been titanic in size. Giants, titans, and others strode the mythic landscapes, the earth quaking at their steps. Now you will be able to use your 3D printer to create 32mm scale figures of these legends, and include them in your Dungeons and Dragons campaign! 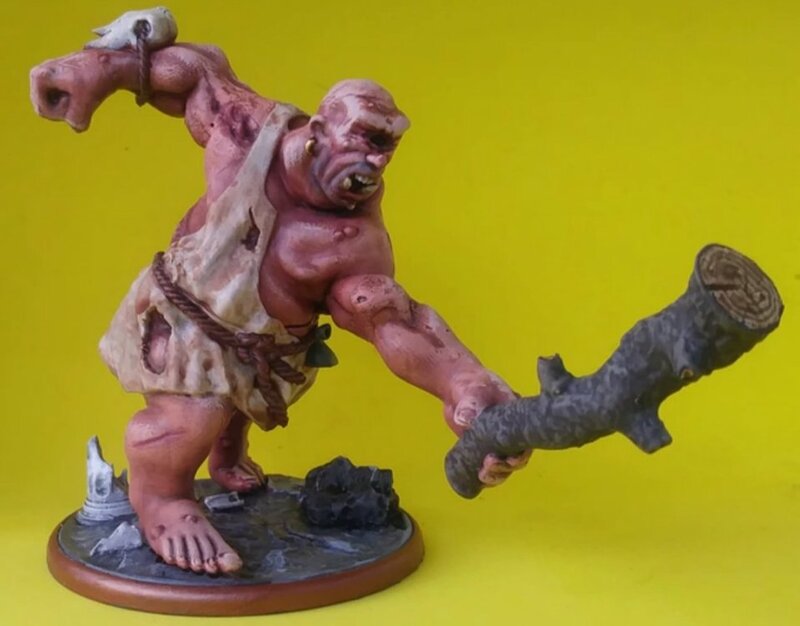 Reaching forth from Greece, France, Denmark, Cornwall, and the Basque region, these giants each include additional accessories, as well as a PDF file that includes their basic story, a statistics block for Fifth Edition Dungeons and Dragons, how to run them in a typical game, and potential adventure hooks to blend them into your campaign! In addition, each of the giants includes a pre-hollowed version for resin prints, and even pre-chopped, multipart versions (hollowed and not) for smaller 3D printers. Most of them can even be used as generic giants, to use how you want in your own campaign! Argus Panoptes is a giant of Greek myth, a cowherd that served Hera with his very life. Included with him are a generic Storm Giant based on him (with helmet and spear), and his beloved Dire Buffalo. From the Basque region of France and Spain comes the Basajaun. Moderately friendly, and creators of the various henges and standing stones, they could also be used to represent various "furry" humanoids, such as yeti. They include two Basajaun, a singe henge, double henge, freestanding menhir, and an altar stone. Hailing from Cornwall, the cannibalistic and miserly Cormoran just might be immortal somehow. He includes files for two different casualties, and a ruined tavern wall. A literary giant, pun intended, the epic "Horn of Roland" includes the mighty paladin Roland's duel with the Saracen giant, Ferragut. With Ferragut comes files to print basic Saracen soldiers, as well as the mighty Roland, himself! Though never fully given a physical description in the epic poem, Beowulf, the monster Grendel is, here, represented as part troll, and part giant. Whether used to represent Grendel himself, or shrunken down slightly and used as a troll, he includes the table and benches from the mead hall, Heorot, as well as his utterly epic foe, Beowulf. I really like that they're all themed encounters with monsters, heroes, and some terrain. They remind me of the "GameMastery Encounter" packs that Paizo used to make. Argus' left arm looks weird. If you follow it from the shoulder it looks as if it should be hanging straight down, but then it suddenly breaks forward. Backed for Grendel. If anything I can always use the scenery pieces. Down to the last 21 hours! I got my Grendel files today. Pretty smooth KS. I'm happy I backed! Anyone print up their files yet? I dont' think we're waiting on anything else from this one either. Can probably be marked complete?